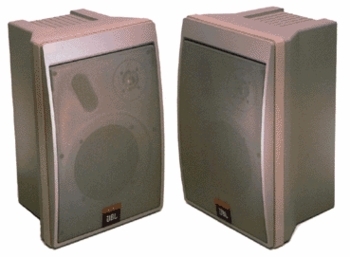 JBL Control 5 Two-Way Compact Speaker DJParts - All Variety of Parts that DJ Needs. The Control 5TM is a high performance, wide range control monitor suitable for use as the primary sound source in a variety of applications. Smooth, extended frequency response combines with wide dynamic capabilities to provide acoustic performance that makes the Control 5 ideal for recording studios, audio-video control rooms, remote trucks and broadcast studios. Clean, functional visual design makes the Control 5 also ideal for foreground music systems, moderate level sound reinforcement, discotheques and music playback systems. A 165 mm (6½ in) low frequency driver provides solid, powerful bass response to 50 Hz. High frequency response to 20 kHz is handled by a pure titanium 25 mm (1 in) dome. Both transducers are magnetically shielded, allowing for use in close proximity to video monitors. The dividing network incorporates protection circuitry to prevent system damage and utilizes high quality components including bypass capacitors for outstanding transient accuracy. MTC-51 Wall Mount Bracket: Allows the Control 5 to be mounted to any rigid vertical surface with a unique polymer ball and clamp design, In addition to omnidirectional movement about the ball, the speaker’s connecting wires may be run internal to the clamp. Note: Accessory attachment points on rear of the enclosure are ¼ x 20 threaded brass bushings, ¹Rating based on test signal of IEC filtered random noise with a peak-to-average ratio of 6 dB, two hours duration. 2Sensitivity is based on a swept 500 Hz to 2 5 kHz signal for an input of 2.0 V @ 4 ohms. JBL continually engages in research related to product improvement. New materials, production methods and design refinements are introduced into existing products without notice as a routine expression of that philosophy. For this reason. any current JBL product may differ in some respect from its published description but will always equal or exceed the original design specifications unless otherwise stated. The loudspeaker system shall consist of a 165 mm (6½ in) low frequency transducer, 25 mm (1 in) pure titanium dome tweeter, and frequency dividing network installed in a ported enclosure. The magnetic assemblies shall use ferrite magnets, with integral shielding of the external magnetic field. The low frequency voice coil shall be 25 mm (1 in) in diameter. The frequency dividing network shall have a crossover frequency of 3 kHz and shall utilize polypropylene bypass capacitors to reduce hysteresis effects on the signal. Performance specifications of a typical production unit shall be as follows: measured sensitivity (SPL at 1 m (3.3 ft) with 2.0 V input, swept from 500 Hz to 2.5 kHz) shall be at least 89 dB SPL. Frequency response shall be within plus or minus 3 dB from 75 Hz to 20 kHz. Usable frequency response shall extend downward to 50 Hz. Nominal impedance shall be 4 ohms. Rated power capacity shall be at least 175 watts continuous pink noise, based on a test signal of filtered random noise conforming to international standard IEC 268-5 (pink noise with 12 dB/octave rolloff below 40 Hz and above 5 kHz with a peak-toaverage ratio of 6 dB), two hours duration. The entire enclosure shall be manufactured of molded polypropylene structural foam. Optional mounting brackets shall be available for positioning of the loudspeaker at various angles for both temporary and permanent installations, Overall dimensions shall be no greater than 387 mm (15¼ in) by 251 mm (9 7/8 in) by 229 mm (9 in) deep. Finish shall be black or white, with metal grille and rubber end protectors.